Welcome to Erie's Public Schools for the 2018-19 school year! 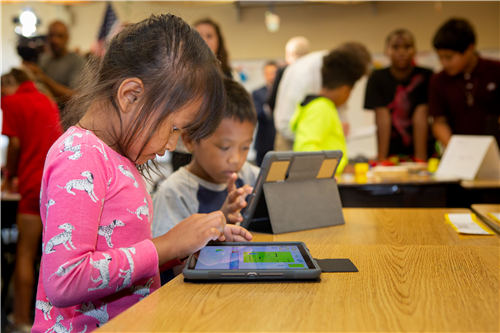 On June 20, the Board of School Directors approved the final version of the district's strategic plan document, which was created after five months of stakeholder-driven input. View the final document here. The board and administration are grateful to the hundreds of teachers, students, parents and community members who lent their voices to create this plan, and we look forward to continuing to work together to achieve our goals for students over the next five years. The first day of school for students is Monday, August 27, 2018. Please click here for an important Back-to-School letter from Superintendent Brian Polito. Below, you'll find additional information to help get your family get ready for the school year. Click here to view a list of our 15 public schools and links to their individual pages. Please note that some school pages are under construction as they update, and we ask that you call your child's school for any specific questions you may have regarding information that may not be listed on their websites. If you are new to Erie's Public Schools and need to enroll your student, we strongly encourage you to do so prior to the first day of school to avoid any unnecessary delays for your student. All information needed to enroll and/or transfer is available on our Child Accounting page or by calling 814-874-6150. Click here for a list of open house events at all 15 of our school buildings. 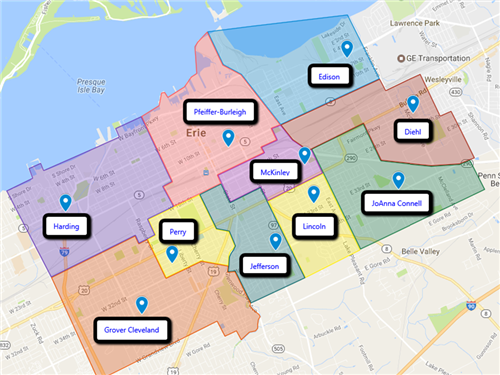 Families can use interactive maps to input their address and determine where it falls in the school boundaries (click on the photos below). Students who live very close to the boundary line between two schools should call the Child Accounting Office at 814-874-6150 to confirm their placement. Please contact your child's school to obtain a full list of school supplies for the 2018-19 school year. The Pennsylvania Department of Health changed immunization requirements in 2017 for all grades, including additional shots for 7th and 12th grade students. These new state laws require your child's immunizations be up to date before the first day of school or they will not be able to start classes. Click here for a list of all required immunizations for students. To view the full Student Handbook, visit eriesd.org/handbook. To view the 2018-19 dress code, visit eriesd.org/dresscode. To view the full Family Information guide, visit eriesd.org/familyguide. 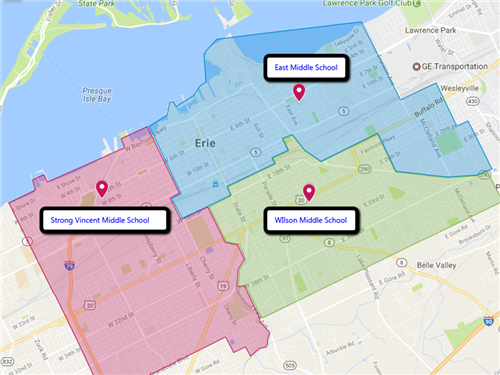 All up to date information on our Erie Royals sports teams, including summer conditioning schedules and sports physicals information, as well as a schedule for our middle school teams, is available on the district's athletics portal: eriesd.org/athletics. Transportation information is available by visiting www.eriesd.org/transportation. This page also includes instructions for applying for a student bus pass, if applicable. Please check this page regularly for more updates and added information. Thank you for supporting Erie's Public Schools!